Construction sites are full of perils for workers, and the rates of fatal injuries to construction workers is evidence of that fact. Of the many opportunities for injury, however, falls on job sites hold the greatest potential to cause fatal injuries to victims. Read on to learn more about the causes of fall injuries, and contact an attorney if you’ve bene injured by a fall on the job in Ohio. According to the Occupational Safety and Health Administration (OSHA), one in every five workplace deaths occurs on a construction site, despite the fact that construction makes up approximately only 4% of the American workforce. Defective or improperly-used ladders: Ladders which are not placed on a flat and sturdy surface can tip or buckle, causing a worker to fall. Additionally, workers who are not provided with a ladder that is an adequate height may be forced to use the topmost step on the ladder in order to do their job, despite the fact that ladders are not designed to be used in this way. Faulty scaffolding: Scaffolding that is improperly constructed or assembled can collapse, causing serious injury to workers. When independent contractors have constructed a job site’s scaffolding improperly, they may bear third-party liability for a worker’s injuries. Absence of guardrails or other hole coverings: OSHA regulations require that workers be protected from falling into openings in a floor or deep holes in the ground through the use of protective guardrails surrounding the fall risk, or through netting placed over the opening. There are seemingly countless opportunities for serious injury on job sites, especially where the owners or site managers are not diligent about training and equipping workers adequately to prevent injuries. Since fall injuries hold such great potential to cause fatal injuries, federal safety regulators have enacted numerous rules requiring contactors and site managers to provide fall protection and safety equipment. Despite these rules and their important function to prevent serious or fatal injury, they’re often overlooked or ignored when management comes up against time constraints or expense. Workers who are injured due to lax safety procedures could have a right to compensation for their injuries. 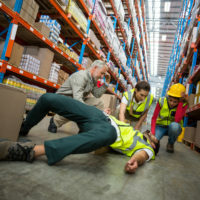 If you’ve been hurt on the job in Ohio, get help seeking the benefits you’re entitled to receive for your injuries including workers’ compensation and disability by contacting the dedicated and aggressive Columbus workers’ compensation attorneys at Miller Law Practice, LLC for a consultation, at 614-591-6822.